If you haven’t yet heard, this past year there has been an explosion of new data from countless health studies and articles that claim sitting for long periods of time is apparently one of the most harmful things we can do to our bodies. Go ahead, Google a few of them and you’ll quickly find that every single hour you sit (after the age of 25) reduces your life expectancy by 21.8 minutes. That may not seem like a lot at first until you do the math. 12 hours a day sitting (at work, at the dinner table, in the car, on the couch, at church, etc) adds up to a whopping 4.36 hours of life expectancy wasted each day. Consider that a single cigarette will carve 11 min off your life expectancy and you can see why sitting is a silent killer that few of us think about. Is sitting the new smoking? Even more surprising is that the results hold true for those of us who exercise regularly as well. People who sit at work all day and then manage to sneak in the recommended 30 minutes of exercise everyday hardly make a dent in the amount of hours they spend sitting. I’m not going to go into all the medical reasons why this happens. There are plenty of articles out there have already done this well. I’m not typically one to read too much into the latest health trends, and I certainly wasn’t in any mood to change my work habits based on a stupid article or two, or three…or twelve. But this information did get me thinking: Are writers doomed to live shorter, less healthy lives than the McDonalds floor-moppers? If not, what’s the alternative? One solution could be a standing desk. That’s right, it seems the hip thing for desk jockeys to do these days is to purchase a standing desk and work diligently while standing. It’s okay – you can chuckle. I know I did when I first read about it too, but apparently it’s not as new as you think. It seems some of the most influential men of their times preferred to work standing up – men like Ernest Hemingway, Winston Churchill and Thomas Jefferson (or so the articles claim). I was intrigued by the concept, but it wasn’t until a friend of mine decided to take the challenge and purchased a standing desk of his own that I got to hear first hand how it was working. After his initial discomfort from adjusting his lifestyle from one of sitting daily to standing upright regularly he discovered something interesting. He was more alert and focused at work and felt more productive. One by one, his co-workers began switching over to the standing desks as well, having seen first hand the difference it made in their colleague’s work personality. Convinced that I shouldn’t dismiss it until I tried it, I recently decided to give it a try for myself. 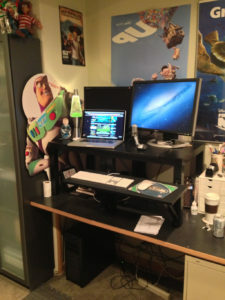 I did a quick internet search for standing desk companies and discovered…ACK…those things cost $800 or more. I was shocked. It was enough to put me out of the running for sure. I’m a writer for Pete’s sake, not a millionaire. But a few searches later I discovered an adequate solution to get me on my feet for less than $22 thanks to IKEA and a little ingenuity. $22 was definitely in the budget range I was looking for. You can read more about the $22 IKEA standing desk solution here if you’re interested in trying it out for yourself. As for me, I’m writing at my standing desk as we speak and while I can say it has taken a bit of getting used to, I’m actually kinda digging it. Only time will tell, but I’m learning that it hasn’t been as big of a change as I first thought it would be. Standing desks may seem silly to us now, but I bet the idea of sitting for 12 hours a day would likely seem as silly (if not downright sinful) to people a few hundred years ago. So, I’m taking a stand for writers everywhere. I’ll post periodic updates on twitter to let you know how it’s working out for me. In the end, if standing adds a few more years of productive writing to my life I’ll be glad I stood. Who knows, one of those books may even crack the best-seller list. Standing in one place for great lengths of time, isn’t much better than sitting. It places on undue stress on your legs. Really, any combination of sitting or standing, while reading would be fine, provided you get regular exercise and take a walk outside every now and then. I’d encourage you to read some of the studies that have been done on the value of standing versus sitting. Certainly you need to do both. Perhaps a tall stool will be in my future soon. But the key is that it’s not very hard to find reasons to sit. Standing takes intentional thought. Also, choosing to take a walk every hour is not likely to happen for me here in Washington state as it is often raining. It would also disrupt my work flow. It’s very interesting that our modern society has come to believe that somehow 30 minutes of walking or exercise can somehow undo a full day of sedentary lifestyle. The studies have found that those in occupations that require them to stand upright a majority of the day live longer. Certainly it’s not the only answer to health, but it’s a great start in the right direction. Sorry, Christopher, I wasn’t trying to imply that a small amount of exercise would undo a full day of sitting/standing. But you’re right, your method would be a step in the right direction. No apology necessary. It’s a new lifestyle change that isn’t easy to grasp. I’m totally unsure of it myself, but willing to “give it a go” as they say. For years, I’ve alternated standing and sitting while working at the computer. I often compose in longhand, and stand to do that, too. It keeps me alert, and gives my back and legs a rest from too much sitting. (How ironic is that?) A good walk helps keep the brain creative; standing helps me focus. Great choices. Sounds like you are a bit ahead of me in your standing journey. I’ve definitely noticed a few of the benefits you’ve mentioned already. I’m anxious to see how this works out for me. There are also “walking” desks. I cobbled up a version of that in my home for a while: it was a treadmill with computer keyboard mounted at a proper height for me to use while walking and typing. It can be done. I find I cannot do it if what I have to do requires a medium to high level of concentration (writing story material would definitely tax my concentration! ), but for just surfing the web, researching, reading email, or even watching video, it is quite easy to set the treadmill to a very slow speed and walk while engaging these activities. So…if you need to do something besides just stand, consider adding a treadmill, or perhaps a stepper. Walking during working has also intrigued me, but I’ve yet to figure that one out. It requires more space and seems less practical for having others gather around your computer with you to discuss things (which happens a lot for me and my brother). I do find myself pacing around while talking on the phone though. For some reason, I’ve never been able to stop walking whilst talking on the phone. I recently read an interesting blog about how walking balances both sides of the brain–something about the right-left-right movements. I’ve tried to do that more recently. I do feel better when I’ve moved around as much as I’ve sat. I do too much sitting. Great comments, everyone. Your points are all well taken. I’m pretty sure my sit > stand ratio is going to be fine if I force myself to stand more often. If I default to a sitting pose for most of my work, I’m more likely to just keep sitting. Thanks Chris! Great inspirtation to follow through on an idea I have tossed around for several years. I too was put off by the prices of stand up desks and have seen a few online contraptions like you’re using, but for $22 or less how could I go wrong. I tried for a short time, only several hours, stacking stuff up on my desk so I could use the computer, found my plan to unstable to really hold my desktop computer. Starting the year with significant back pain and a re-injury I am motivated to get out of my seat and stand! Be sure to follow the height measurements detailed in the article I linked to. I also chose to purchase a second $7 sidetable to put side by side with the other. It gave me a wider desktop and room for my laptop to be open as well. Brought cost of ownership up to $29. Still not too bad. Sorry to hear about your back, though. Hope it works. You can always stop by and see our setup if you want. I set up a treadmill desk over two years ago and used it while writing my last couple of novels. I’m not in the league of say, Arthur Slade (who treadmill-writes for an average of four hours a day) but I try to get in at least 30-45 minutes of treadmilling and another hour or so of standing-to-write during the day. Today I did 35 minutes of the “Rolling Hills” program on my treadmill at 1.6 km/h while writing, and another 10 minutes on the flat. I agree with those who’ve said it improves concentration. I can’t say it improves my energy because I do get tired and have to sit down after 35-45 minutes, even if I’m on a roll… but then I suppose that just betrays how generally out of shape I am.